Are you familiar with MountainView vinyl windows? Actually, answer this question first. How often do you think about your home’s windows? For most of us, it is not very often, even though windows have several important roles. After all, they allow the sun to shine in and give us the chance to let some fresh air in, while also protecting us from the elements, possible intruders, and even outside noise. On the other hand, when the frames become warped, or the windows crack or break, we are often stuck with high energy bills, leaks, decaying frames, outside noise, and a potential entryway for intruders. Whether you are looking for windows for a brand new house or need to replace your existing windows, MountainView vinyl windows may be the answer. If you are already familiar with MountainView, you may already know about the many benefits they offer. If not, here’s everything you need to know. Drafts can do much more than sending your monthly energy bill skyrocketing. They also let water in, which could result in mold, give insects a way of entering your home, and reduce your interior air quality. MountainView windows are equipped with an air-tight interlocking seal system that prevents drafts and all the problems that come along with them. MountainView vinyl windows feature the latest technology to ensure superior energy efficiency. They are Low-E windows, meaning they reduce heat transfer, keeping you warmer in the winter and cooler in the summer. In addition, the areas between the panes of glass are filled with argon gas to prevent cold air from penetrating your home in the winter. Finally, they have a U-factor of .29. U-factor measures your window’s rate of heat loss. The lower the number, the greater the window’s resistance to heat flow and the better its insulating properties. In simple terms, MountainView vinyl windows are exceptionally energy efficient, which keeps your energy bill down and increases the lifespan of your HVAC unit because they do not have to work as hard. 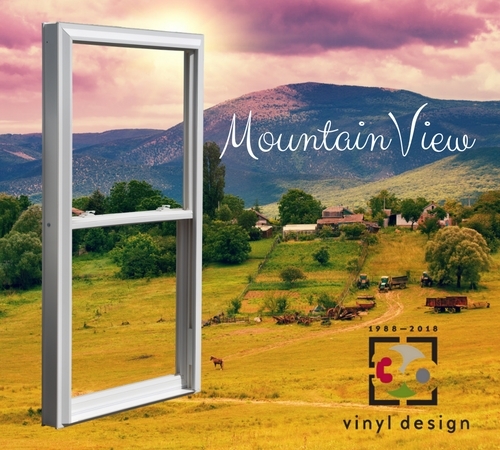 MountainView vinyl windows require no maintenance. You will never have to worry about painting, glazing, resealing, or any other common maintenance task. Instead, you can relax and enjoy the view out of your windows, which is mainly impressive due to the exterior glazing that provides a clean interior appearance. Best of all, MountainView vinyl windows come with a lifetime guarantee. MountainView windows are equipped with everything from integrated night locks to out composite reinforced locks to offer peace of mind. With that being said, they are also easy to use, thanks to the constant force balance system, allowing you to let fresh air in easily. As an added bonus, you can easily and safely clean their exteriors using the intuitive tilt in the top and bottom sashes. According to Home Remodeler Magazine, homeowners can expect to recoup as much as 71% of their vinyl replacement window investment if they choose to sell their home. Are you ready to invest in MountainView vinyl windows?